Myrrh essential oil is being studied in clinical tests to determine how it can be used medicinally. Why? Because it has already proven to be extremely useful in the treatment of a wide range of maladies. I think it is great that we are finally realizing what our ancestors new. Myrrh essential oil is an incredibly useful, natural remedy that needs to be utilized more in our everyday lives. Most people recognize myrrh from the bible. It was one of the gifts presented to the baby Jesus by the three wise men. This essential oil has actually been appreciated for its healing powers since ancient times. Myrrh is high in antioxidants, has antibacterial, antimicrobial, antifungal and anti-parasitic properties and helps fight cancer. It is actually a main ingredient in an anti-parasitic medication. Myrrh essential oil fights aging with antioxidants, boosts the immune system and has been proven to help fight cancer. ﻿Myrrh also has antibacterial, antimicrobial, antifungal and anti-parasitic properties. Mix myrrh essential oil into a carrier oil and apply it to your skin to moisturize and reduce signs of aging. The recipe is 1 part myrrh EO to 3 parts carrier oil. You can use grapeseed oil, jojoba oil or coconut oil. Argan oil is also a great carrier oil to use for moisturizers. It contains vitamins A and E, which are both great for the skin. Put a few drops of myrrh essential oil on a clean, soft towel or wash cloth and apply it directly to the skin. Dab it right on the red, irritated patches of skin caused by athlete’s foot and ringworm. Its anti-fungal properties will make short work of any fungal infection. Put a few drops of myrrh on a cotton swab and dab it directly on acne sores. Its antibacterial, antimicrobial and antiseptic properties will quickly dry up and heal the sores. If you are prone to acne, mix a few drops of myrrh EO into a fragrance free lotion and use that to moisturize your face and body. It will help prevent break-outs. Apply myrrh essential oil to scrapes and minor abrasions or wounds to prevent bacterial infections and speed healing. You can put the myrrh EO on a gauze square to dab the oil on or gently hold it on the wound for a minute to apply the oil to the wound. Remove the gauze and apply a bandage to help protect the wound while it heals. Add a few drops of myrrh EO to your aromatherapy oil diffuser and run it for 30 to 45 minutes. Inhaling this oil will help you relax and reduce anxiety. You can also put a few drops into your bath water and soak for 30 minutes for deep relaxation. Mix a few drops of myrrh EO into a carrier oil and massage it into your sore, achy muscles. It will help the muscles relax and actually relieve your pain. You can use coconut oil, grapeseed oil, jojoba oil or argan oil. Use myrrh EO on a cold compress to relieve inflammation. Put 6 drops of myrrh essential oil in 9 ounces of ice water. Dip a clean towel or washcloth into the solution and apply it to inflamed or infected skin for 10 minutes at a time. It will reduce the inflammation and swelling more quickly than if you just use a cold compress. The oil is absorbed by the inflamed tissues and continues to work to reduce swelling after you remove the cold compres﻿s. Use a myrrh essential oil cold compress to treat headaches. 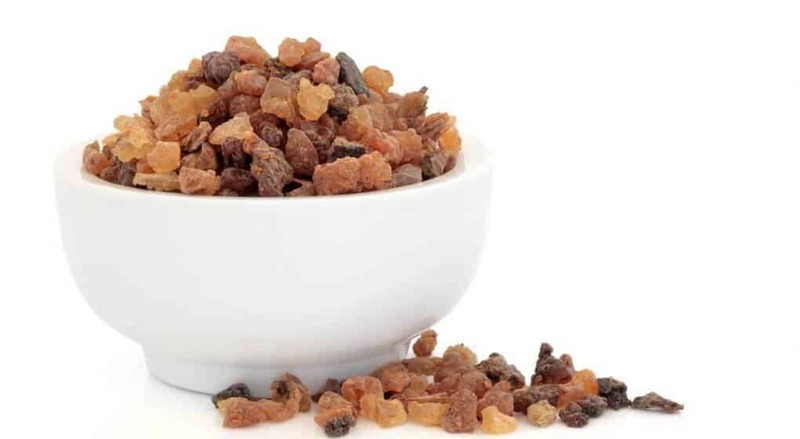 Mix 6 drops of myrrh into 9 ounces of cold water, wet a towel or washcloth with the solution and wring it out. Place the towel or washcloth on your forehead for 5 to 10 minutes, re-wetting it when it gets warm. Your headache should quickly dissipate. Put a few drops of myrrh essential oil into a diffuser and run it for 30 to 45 minutes to get relief from cold symptoms. It will help reduce inflamed sinus tissues and sooth a sore throat. You shouldn’t run the diffuser for any longer than 60 minutes, though. Excessive use of any essential oil can cause problems. Myrrh essential oil is a natural expectorant. Use it in your diffuser for 30 to 45 minutes. The myrrh will help reduce the inflammation in your throat and lungs and thin the mucous to make it easier for you to clear it out naturally. Be sure to drink plenty of water. Use myrrh essential oil mouthwash to help heal gum disease and oral irritations. Add a few drops to tepid water, swish and spit. Regular use of this mouthwash will also help prevent gingivitis and bad breath. You can also add 2 teaspoons of echinacea tincture and 2 drops of tea tree essential oil to this mouthwash recipe, if you like. Just make sure you don’t swallow any of it. Tea tree essential oil is toxic. Myrrh essential oil has been proven to be a very effective treatmen﻿t for Fascioliasis or liver flukes. There is an actual medication for liver flukes that is made with myrrh. Use myrrh essential oil to help correct hypothyroidism. It works by reducing stress on the thyroid gland. Apply 2 to 3 drops of myrrh EO on the throat where your thyroid gland is located once each day and gently rub it into the skin. If you have been diagnosed with skin cancer, talk to your doctor about including myrrh essential oil in your treatment plan. You can put 2 to 3 drops of myrrh essential oil right on the skin cance﻿r lesion each day. It has been proven effective at killing cancer cells and helps the skin heal. Use myrrh essential oil to reduce scars on your skin and stretch marks. Mix 1 teaspoon myrrh EO into 1 tablespoon of argan oi﻿l, coconut oil, grapeseed oil or jojoba oil. Work a small amount of the mixture into your skin a couple times a day. Argan oil is especially good for this. Diffuse a few drops of myrrh essential oil in your aromatherapy diffuser to help relieve hoarseness and voice loss. Run the diffuser for 30 to 45 minutes a few times a day until your voice returns to normal. You can also mix a few drops into a carrier oil and rub that on your throat to help sooth your vocal cords. Give your immune system a boost with myrrh essential oil. Use the 1 part myrrh oil to 3 parts carrier oil recipe. Rub it into your skin once or twice each day. The myrrh oil will be absorbed into your immune system through your skin. You can use any type of carrier oil you prefer for this. Use the same myrrh essential oil/carrier oil recipe to improve digestion and reduce diarrhea and gastric﻿ upse﻿t. Just rub it into the skin on your abdomen. Again, you can use coconut oil, argan oil, grapeseed oil or any carrier oil you like. Diffuse myrrh essential oil in your vaporizer or aromatherapy diffuser to improve mental clarity and focus. Just put a few drops in your diffuser and breathe it for 30 to 45 minutes. You can also use a mixture of 4 drops of oil and about a tablespoon of sweet almond oil for the same purpose. Rub the mixture into the skin on your chest, abdomen and lower back. The myrrh essential oil will work its way into your system through your skin. Was this list helpful to you? I was very pleased to learn about all of the wonderful, natural benefits of myrrh essential oil. The fact that it can help fight difficult-to-cure infections which have been resistant to available antibiotic drugs makes this essential oil indispensable. I hope you will begin using myrrh essential oil today. With its immune-boosting properties, using it now can help you stay healthier in the future. Please leave a comment to let me know if this list helped and tell me about your own personal experiences with myrrh essential oil. We can just keep adding to the list of great uses for it. Be sure to share so that others can become aware of all the benefits of this essential oil.